Tags: Antique Print, Asia, Indonesia, Java, Tiger. 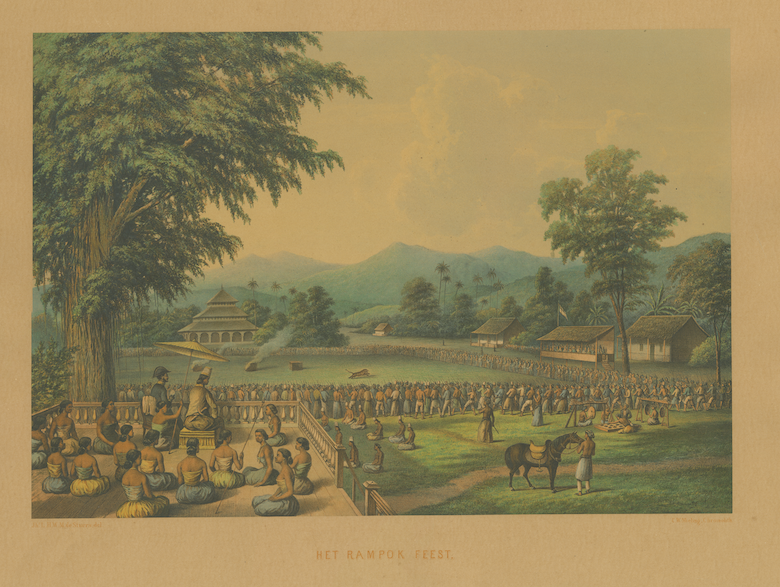 Antique print titled ‘Het Rampok Feest’. 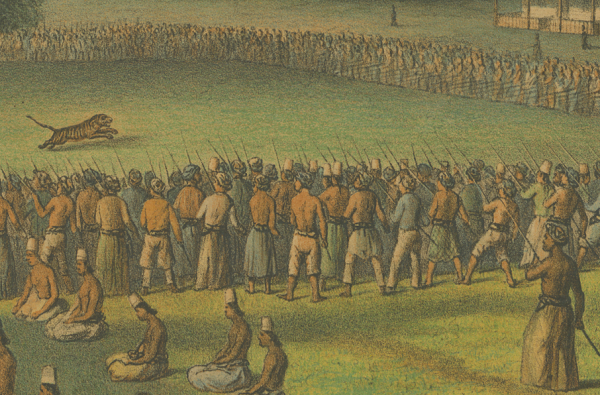 Extremely rare chromolithograph of a A ‘Rampok Makan’ or elaborately-staged tiger fight in Java, after an oil painting by Louis Henri Wilhelmus Merckes de Stuers. 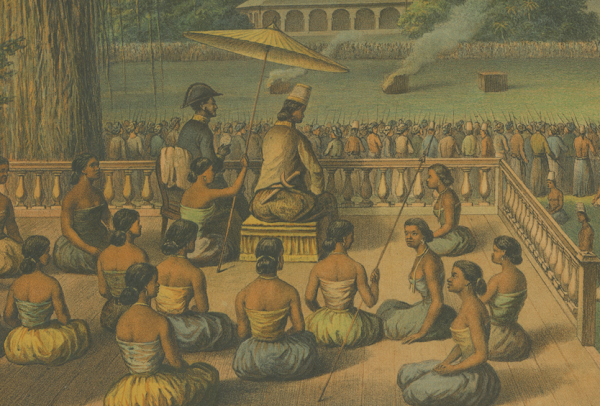 The tiger fight or rampok matjan was a popular spectacle with a ritual character. Captive tigers or panthers are killed in public. It is a time-honoured tradition: the struggle between man and beast, with the tiger representing evil. Initially the rampok matjan formed part of the ceremonies of the Middle Javanese courts at the end of Ramadan. In those times the fight was more sensational, as it took place between Bengal tigers and buffaloes or banteng. Then too the intention of the fight was that the tiger would lose. For many spectators the tiger symbolized the colonial regime, whereas the banteng represented the Indonesian people. 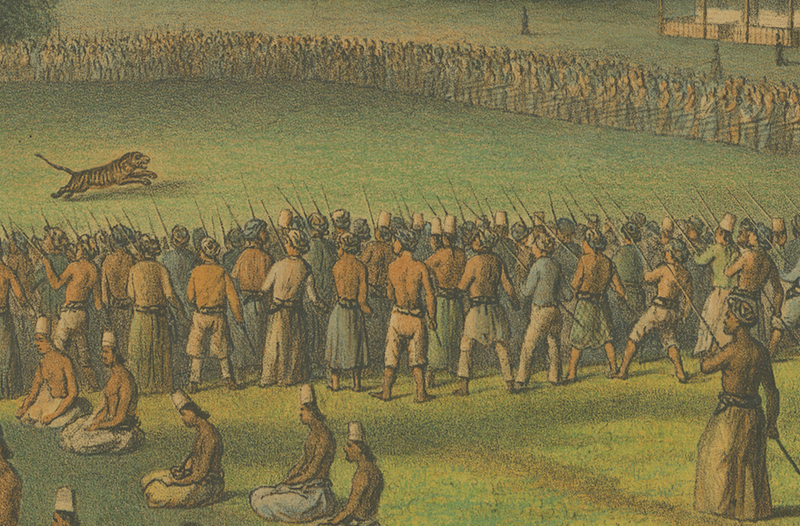 This plate of a staged tiger fight in Java was published in De Indische Archipel by C.W. Mieling between 1865 and 1876, and is one of the most rarest chromolithographs on Java on the market today.